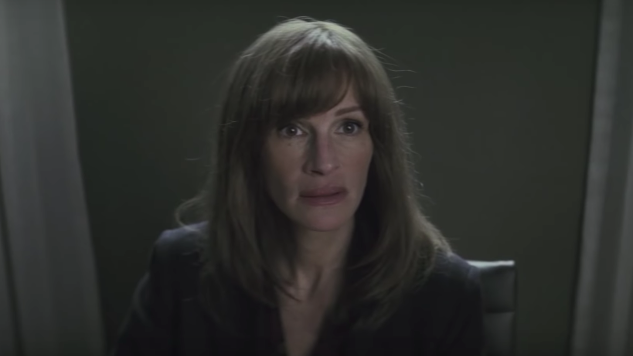 Eternal rom-com queen Julia Roberts is taking on something a bit more experimental in the trailer for her television debut, Amazon Prime Video’s Homecoming, a psychological thriller series created and directed by Mr. Robot’s Sam Esmail, and based on the fictional Gimlet Media podcast of the same name. Esmail directed all ten episodes of the series, and served as co-showrunner along with Homecoming podcast creators Eli Horowitz and Micah Bloomberg, who also served as writers and executive producers. While shows like Amazon’s Lore have been adapted into television series from nonfiction podcasts, this is perhaps the first time that a fictional podcast has made the leap between formats. As we learned at the series’ Television Critics Association press conference back in July, Homecoming is also the rare half-hour drama, hard to find in a television landscape where hour-long dramas have historically been accepted as the norm, and particularly so in the streaming era, in which episodes tend to run even longer. The unsettling first trailer for Homecoming also suggests that Roberts’ television debut is going to mess with viewers’ heads. We switch between different timelines and aspect ratios as the camera continues cutting to a haunted Roberts, who doesn’t ever flash her famous mega-watt smile. In one of the show’s two timelines, Heidi Bergman (Roberts) is a caseworker at the Homecoming Transitional Support Center, helping military veterans transition to civilian life. She’s assigned to Walter Cruz (Stephan James), a young veteran eager to rejoin civilian life and with whom she has a complex relationship. Heidi also runs into Colin Belfast (Bobby Cannavale), Heidi’s ambitious off-site supervisor of the Homecoming Initiative, whose motives at Homecoming don’t seem all that clear. Four years later, Heidi is now a small-town waitress living with her mother Ellen (Sissy Spacek) and being questioned by Department of Defense auditor, Thomas Carrasco (Shea Whigham), on why she left the Homecoming facility. Over Homecoming’s limited ten-episode run, we follow Heidi as she comes to question the narrative she’s built for herself. Alex Karpovsky, Jeremy Allen White and frequent Roberts collaborator Dermot Mulroney also star. Roberts will also appear opposite Lucas Hedges on the big screen later this year in Ben Is Back, but fans interested in seeing a new side of her can check out the first season of Homecoming when it premieres on Amazon Prime Video Nov. 2.